Forget the Oscars, we've got the Ahh Scares celebrating the best horror films of 2017. Presenting these 27 awards are some of our favorite horrortubers including Horror Addicts LOLZ and Canadian Jason. 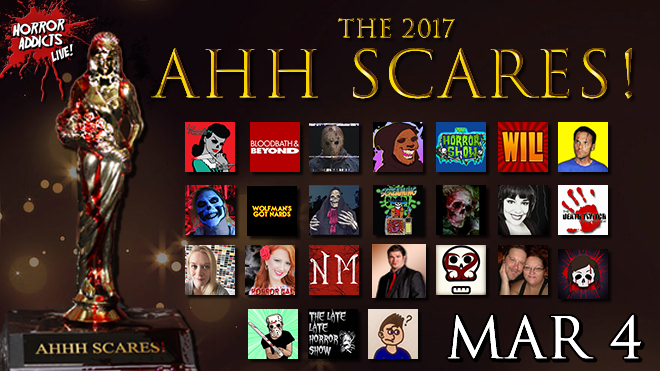 Nominations were put together by the Horror Addicts, winners were voted on by the academy of horror nerds collected from our Patreon, fellow horrortubers, Crypticon family and horror friends. So, join your MCs Danny Knightmare and Gory B Movie for a night of glamour, sophistication and BLOODSHED! See the video description on YouTube for the full list of awards and presenters. All of our presenters are linked below under the collaborators credit.